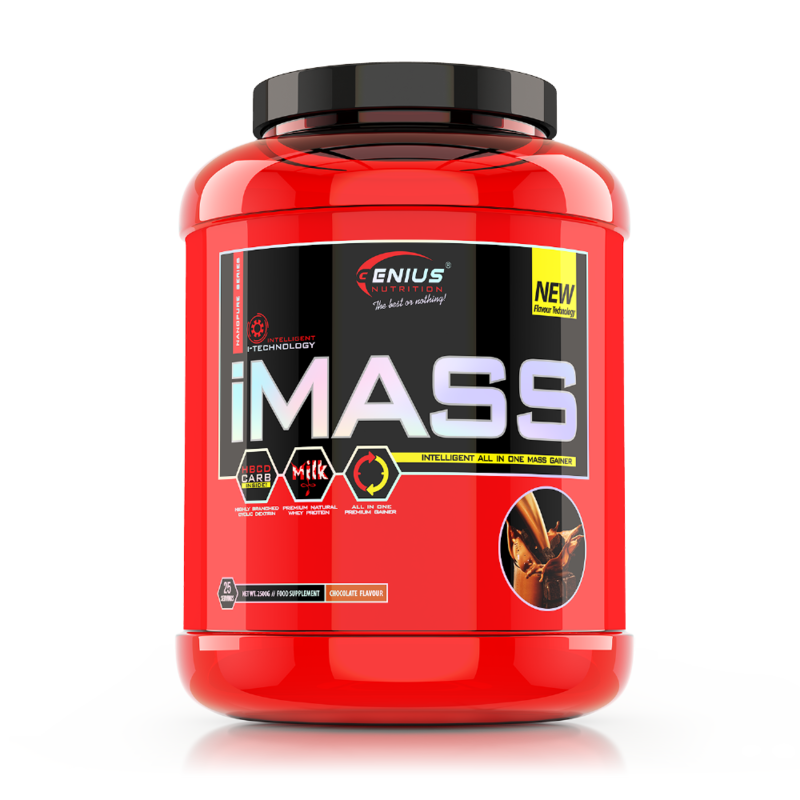 Genius iMass™ is the latest revolutionary muscle gain formula with the most powerful all-in-one ingredients to support recovery, strength, muscle mass and performance! Manufactured using the strongest ingredients in precise doses with a massive impact on muscle mass, strength and performance like you’ve never seen before. 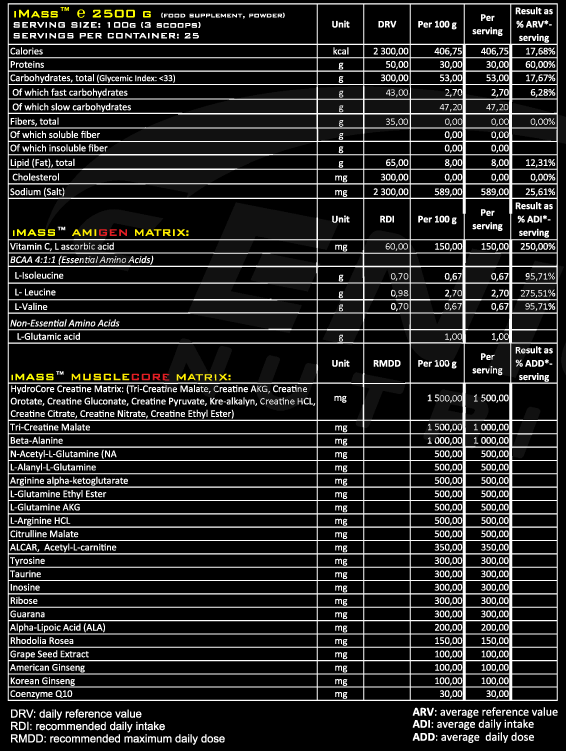 iMass™ is an ideal balance between iWhey Fusion whey proteins (WPC, WPH, WPI) and carbohydrates. iMass™ will feed the muscle with high quality nutrients, the results of which will show faster than you think! This effect is due to the additional blend of amino acids, BCAA, glutamine, beta-alanine, arginine HLC, plant extracts and creatine, which are ready for action anytime! iMass™ contains 6 additional blends with over 24 active ingredients, making it the most complete mass-gain supplement from the industry that has ever been created! Full Recovery Matrix (FRM) - increases the cellular protein synthesis, offers a maximum anti-catabolic effect. Pump intensifier & Endurance Matrix (PEM) - increases the workout’s intensity by reducing the fatigue, significantly increases the endurance, pump and strength! Intensity & Focus Matrix (IFM) - offers an efficient support of mental focus and concentration during the workout, for maximum “Mind to Muscle” results. Body Performance Matrix (BPM) - smart way to allow the body to use oxygen more efficiently and feed the ATP. The result is greater strength, energy, stamina and promotion of lean body weight. It produces a powerful synergistic effect together with CreaGain™ Matrix. Antioxidants Support Matrix (ASM) - provides metabolic antioxidant support and protects from free radicals. HydroCore Creatine Matrix (HCM) – a creatine blend of a new evolution level, supporting muscle growth, strength, performance and recovery. With 10 different forms of creatine combined synergistically to maximize the absorption and to offer the best results ever. iMass is the fastest, healthiest way for real muscle gain. Nothing could ever beat iMass. iMass™ Directions of use: Blend, shake or briskly stir contents of one serving (approx 2-3 scoops) into 500 ml liquid until smooth twice a day. Can be blended with fresh or frozen fruit for flavor variety. Cold water can be replaced by milk. Do not exceed recommended dosage.